No, not that time, geesh, my dad reads this blog, I would NOT be talking about that. It's that time of the month when my Fix shows it's pretty little stylish head. This month was a difficult one. I liked everything. I didn't necessarily like how it fit me, but I liked the items the most this time. I really liked how this shirt fit. I hated the crochet part. I also wasn't a huge fan of the color, it's just too hot out right to wear darker colors. And it was slightly see thru which meant I would need to layer up and well, it's too freaking hot here in the summer to do that. On Facebook, it was mixed reviews, you loved it, you hated it, you wanted me to layer. I loved the colors, I loved the top half. I hated the bottom half. I felt like this shirt made me look pregnant. On Facebook, you all agreed with me, made me look pregnant. I pretty much knew right off the bat that I was not going to like this shirt. It just looked frumpy when I pulled it out of the box. When I put it on, I immediately thought I looked pregnant. 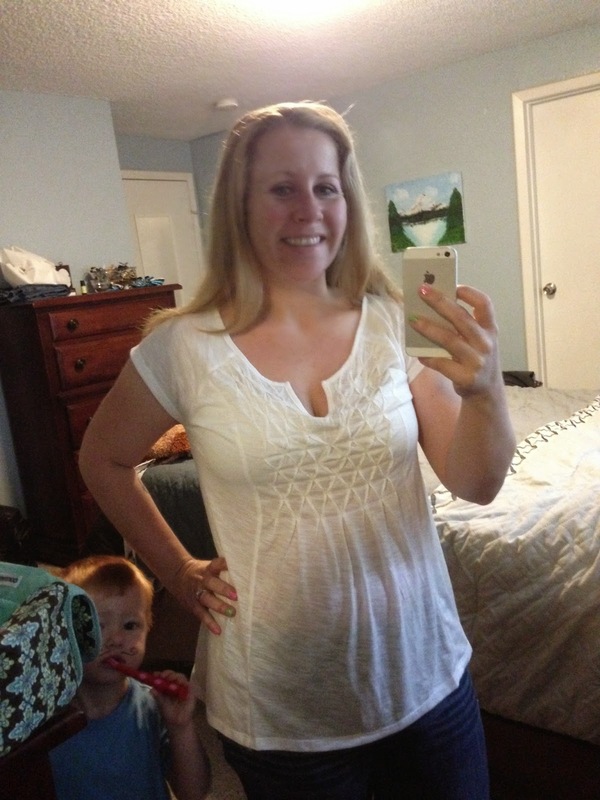 I also hated that I would need to wear a cami under it since the Seattle summers are not fun to layer in. I wasn't sure how I was going to feel about this shirt. I liked it. I didn't love it. 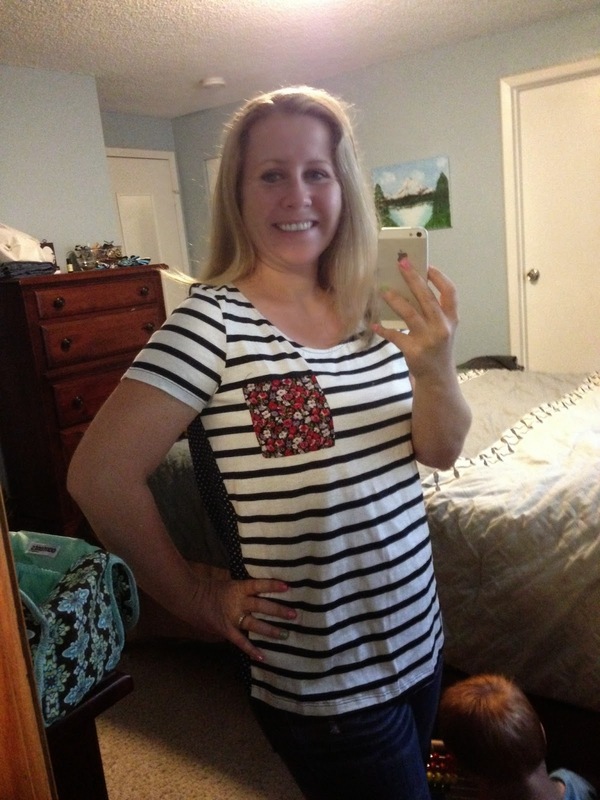 The material was nice and soft, but I was iffy about the pocket and the mixed patterns made me twitchy. You have to know that with me, up-to-date fashion is really just not for me. I need clothes that will last the tests of time. I don't want something that will be out of fashion next year. On Facebook, you all loved it! However, it seemed that you all had the same reservations as I did with the pocket. I looooved this shirt. I loved the colors and how, although thin the material was, it wasn't see thru. I felt comfortable in it and grown up. I wore it outside my house and got a million compliments on it. 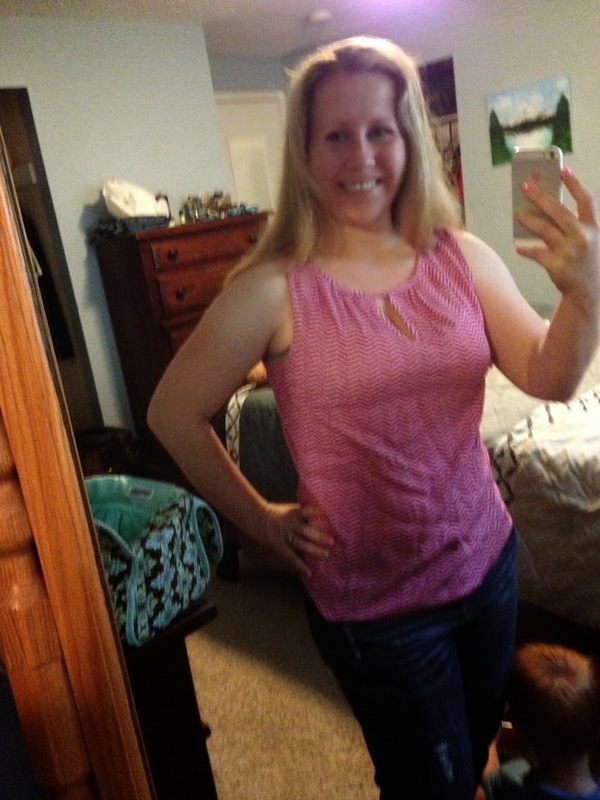 I haven't been huge on sleeveless shirts, but I didn't mind this one. Plus, it's something I can wear all year because I can pair it with a cardigan and be good in the cooler seasons. On Facebook, you all seemed to agree with me about loving it. Very few of you seemed to think that it was boring or unflattering. Update: Because I had specifically asked a few times for Stitch Fix to only send me wash and wear items, I did not check the tag on this shirt. It was in fact, a hand wash only shirt. So of course when I washed it, it shrunk and I can no longer wear it. I emailed Stitch Fix to tell them, that in the future, I would need them to please pay attention to my very specific requests since I am paying a significant amount of money for their clothing. I am so happy to report back that they are going to take my shirt back in a return and refund my money. Every interaction that I have had with Stitch Fix outside of just their normal services have been outstanding. I love that I can put so much faith into a company like this. You don't find customer service like this often anymore. I also love that because I have faith in their customer service I feel even more confident in my recommendations, to you, my readers. 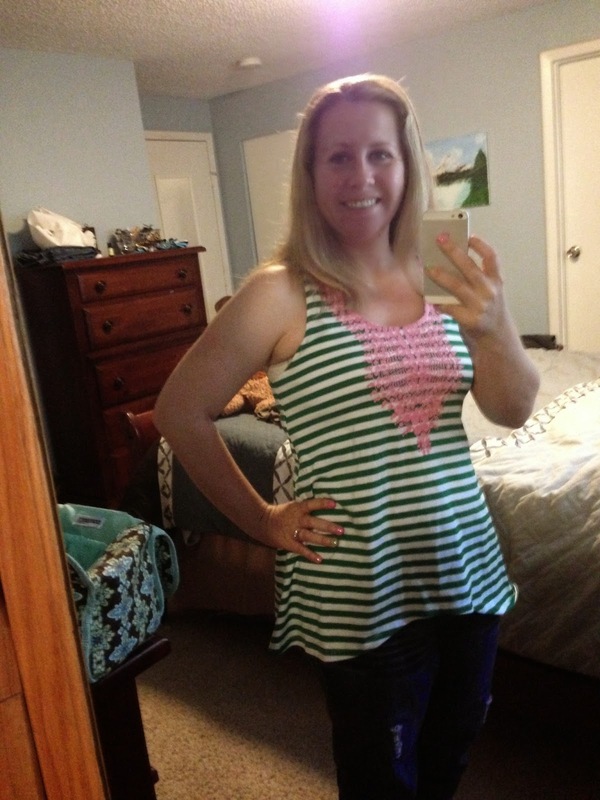 Thanks Stitch Fix for being awesome! 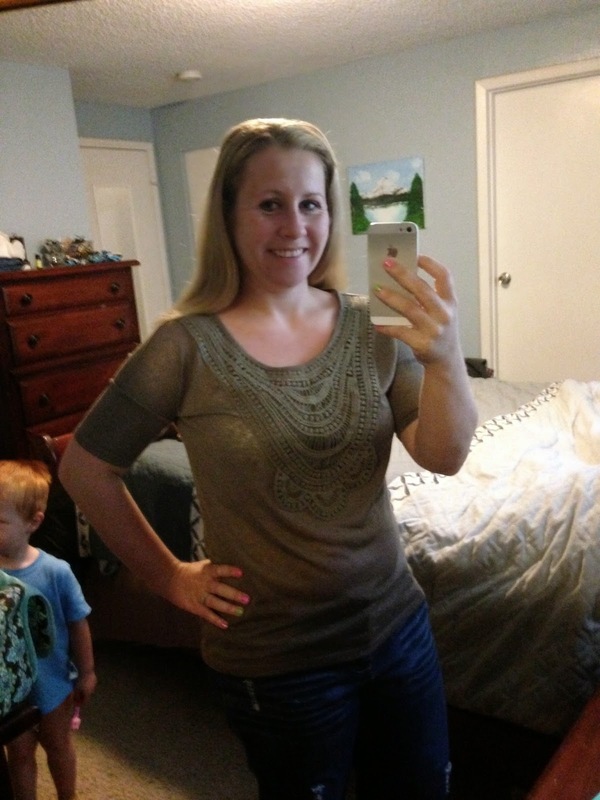 To read about my other Stitch Fix reviews, click here. This post contains referral links. If you click and sign up for Stitch Fix by using one of my links, my Stitch Fix account will be credited with a $20 referral fee. That striped tshirt looks so flattering on you! But I can understand what you mean about trendy pieces, sometimes they just never seem to make it out of the closet. It's great to hear about a company with such good customer service!